Description: A gingko leaf cast in fine silver provides the inspiration for this piece. Because gingko trees are the oldest trees on earth, it's called "Persistence". The leaf hangs from a necklace of amethyst which has sterling silver beads interspersed through it. 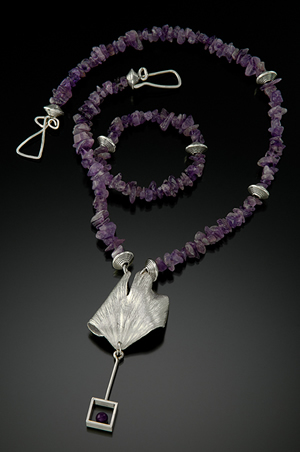 At the bottom is a sterling frame which contains an amethyst bead. The necklace is closed with a lovely hand wrought clasp.